HomeGenerationGeneration updates and trends for October 2018. 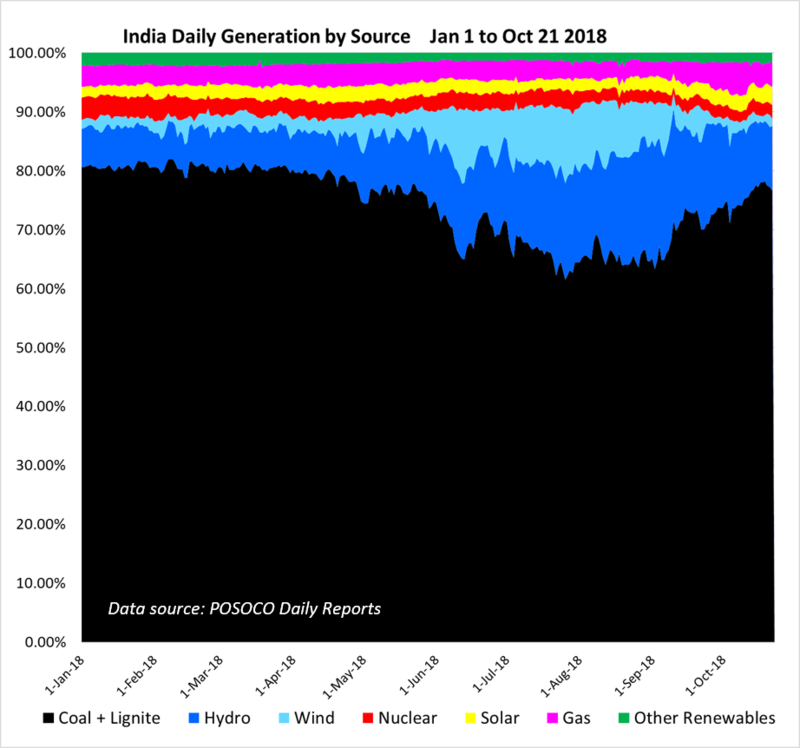 Generation updates and trends for October 2018. 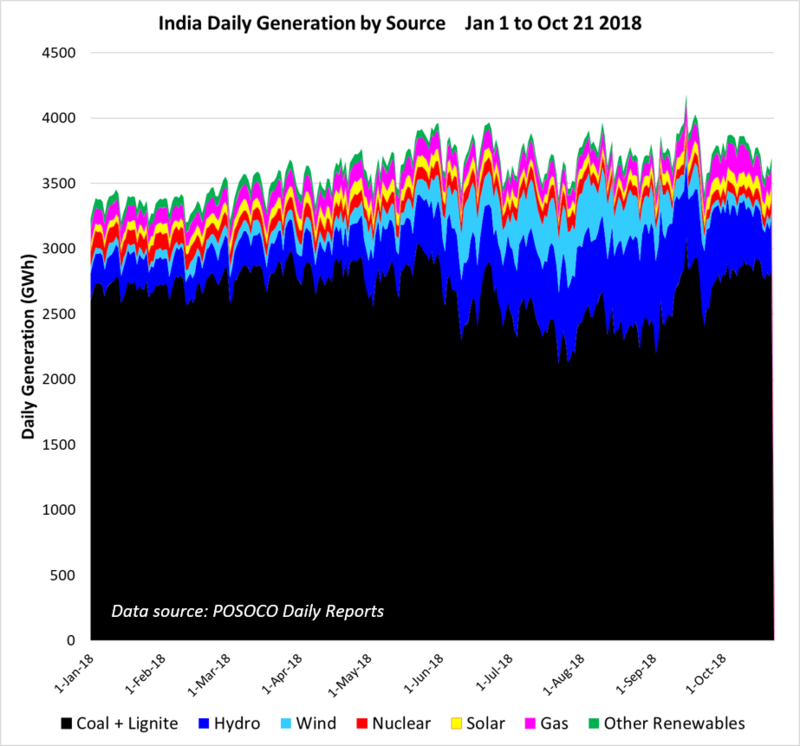 These patterns are as expected, but a noteworthy feature was an uptick in gas generation for several days in early October (shown in pink above and below), which normally makes up about 3% of total generation, to over 5%, or about 200 GWh per day. 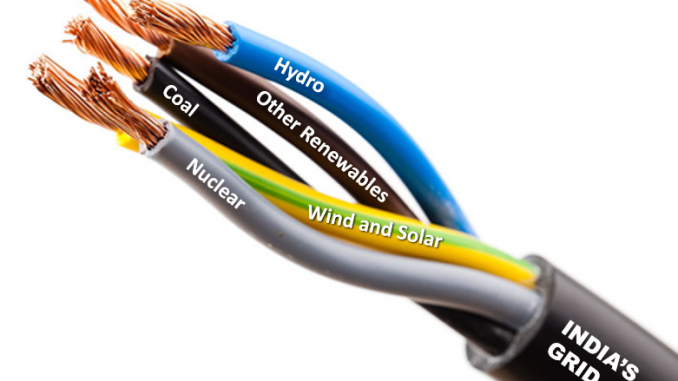 Renewable generation trends showed a continued rise in solar’s contribution. 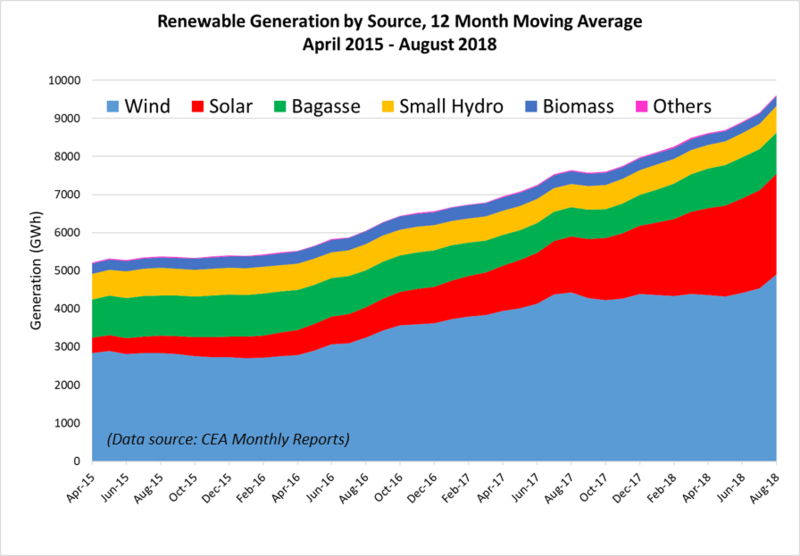 In June, July and August (the most recent month for CEA data), solar produced, respectively, 67, 54 and 59% more energy than in the corresponding months in 2017. 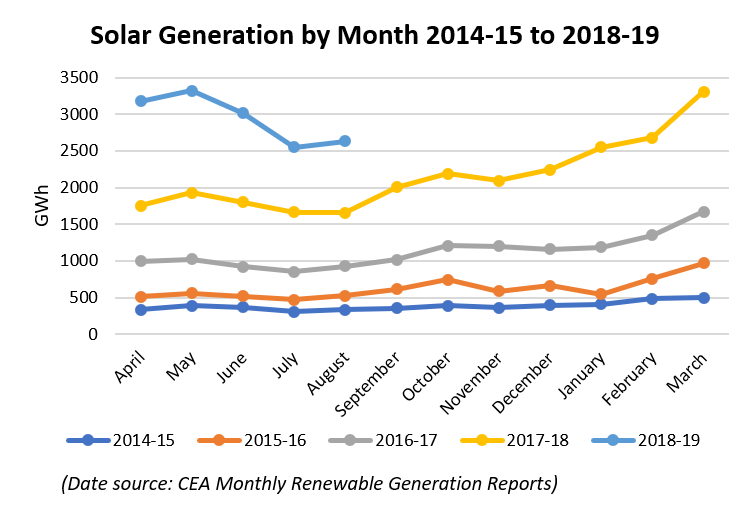 Wind power also increased, up 15, 16 and 17% for the same months. 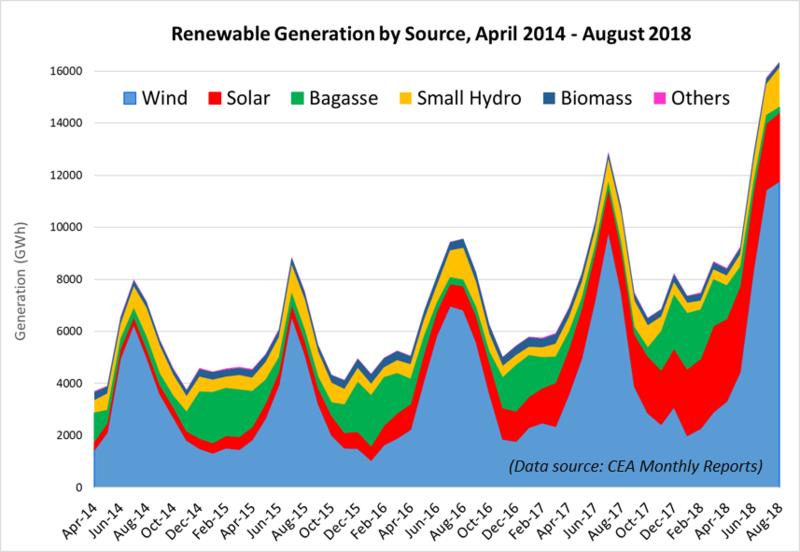 Overall, renewables edged up to an all-time high for any 12-month period, to reach 8.6% of total generation. 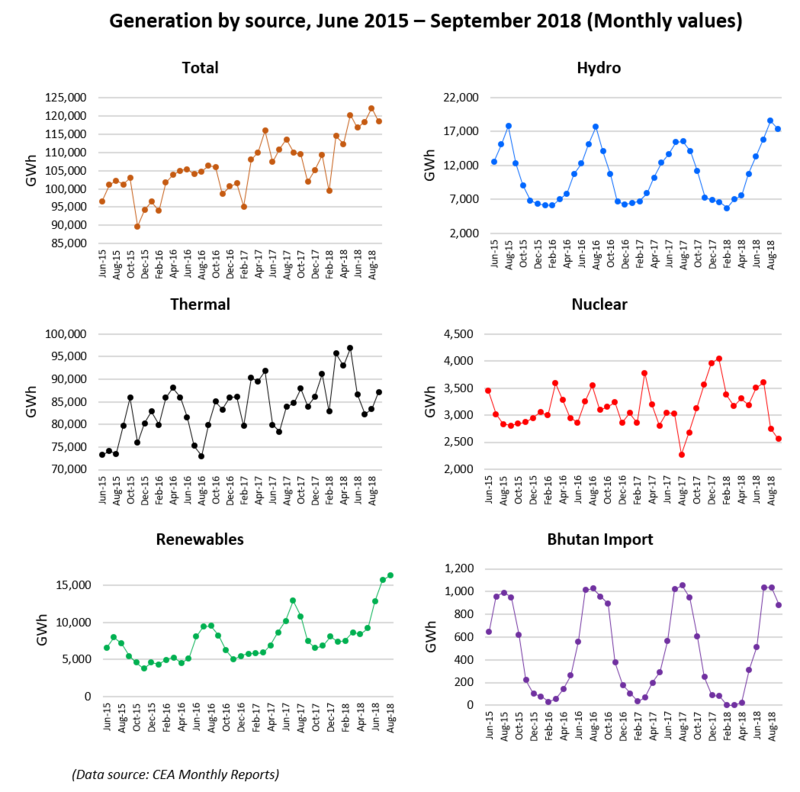 IPR now expects renewables to reach the milestone of 10% of total generation on a 12 month basis, in November or December 2019.
but what about solar seasonal variation? it’s not clear with, it would be good to see solar in separate graph to study it. Good question, Qui! 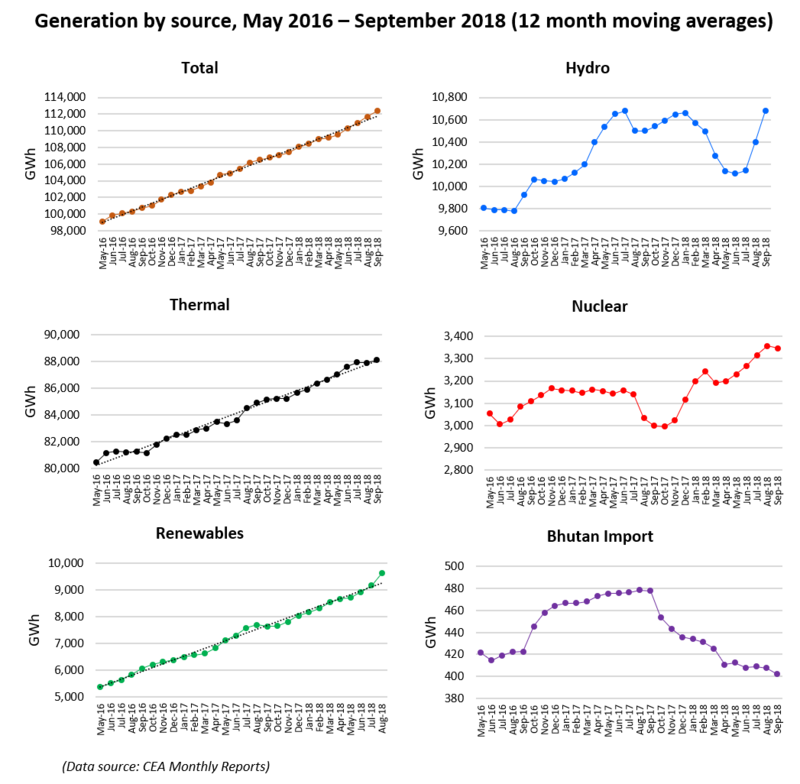 As you can see in the graph below, the seasonal effects for solar generation tend to be masked by the rapidly increasing solar capacity. This is especially evident for FY 2017-18. But less capacity has been added in FY2018-19, and you will observe a peak in May. This corresponds to the increased levels of solar insolation, which peaks throughout most of India in that month. See, for example, the red area (high insolation) for May (left-hand column, third row) in the graph below, by Dr. T.V. Ramachandra at IISc Bangalore, whom I had the pleasure of meeting there a couple of years ago. You can view Ramachandra’s original here.